Although the station had been closed for over a month the flower bed here on the down platform still looks well cared for. 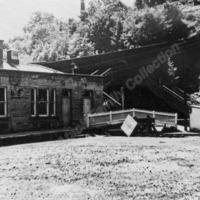 The other side of the fence is the small timber Booking Office connected to both platforms by the footbridge. 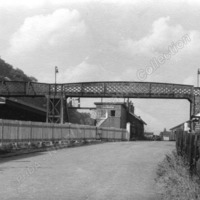 View looking up the approach road. 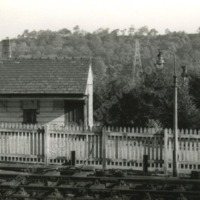 On the right is the small timber Booking Office and on the left the signal box and down platform buildings. 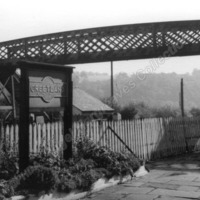 The footbridge connected the platforms and was the only passenger access to the up platform. 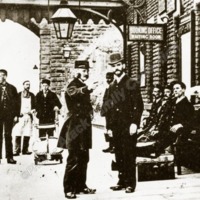 The station on the Halifax –Bradford line opened at the same time as the line in August 1850. 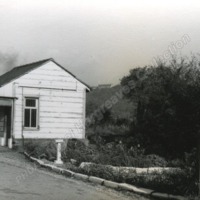 The station was closed in 1953. Station staff posing for the camera on the ramp from the entrance building down to the eastbound platform with the footbridge to the westbound platform to the right. LYRS 8640 - 1967. 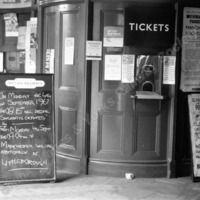 The Booking Hall seen here is no longer in use but there is still a staffed Ticket Office accessed from the Manchester Platform. LYRS 6031 - 1967. 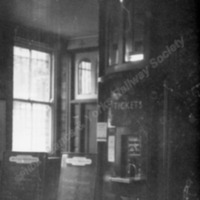 The Booking Hall seen here is no longer in use but there is still a staffed Booking Office accessed from the Manchester Platform. LYRS 6092 - 1963. 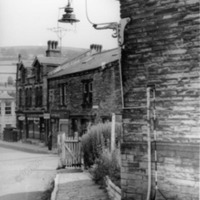 Gas lamp outside the Booking Office looking down Station Road a year after the station had closed. On the Holmfirth Branch off the Penistone Line. 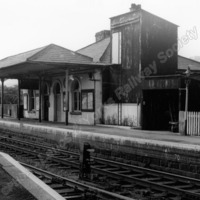 It opened in 1850 and closed in 1959 and the track was dismantled in 1966.